On Second Day On Stand, WikiLeaks Suspect Manning Admits He Made Noose : The Two-Way The U.S. government argued Manning was held under near solitary confinement for his safety. But Manning, facing his prosecutor for the first time, challenged many aspects of the government's narrative. This artist rendering shows Army Pfc. Bradley Manning, right, being shown a bedsheet as he testified in his pretrial Wikileaks hearing in Fort Meade, Md. Bradley Manning, the Army private accused in the biggest leak of classified information in U.S. history, took the stand for a second day in a row, today. Politico reports that in one more dramatic moments of the Article 13 hearing, Army Capt. 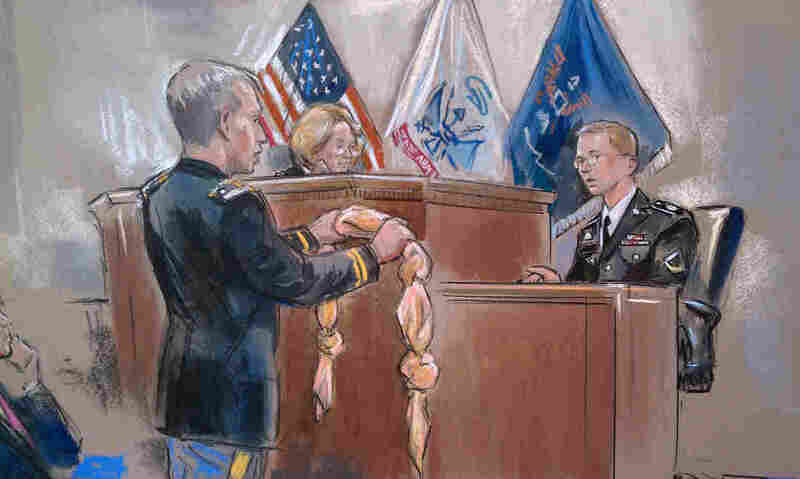 Ashden Fein, the military prosecutor, pulled out a noose from a paper bag. Manning admitted that he had made that noose while he was being held in Kuwait. Manning is making the case that charges or his sentence should be put aside because of his harsh pre-trial treatment. The government was making the point that they held him in near solitary confinement because he was a danger to himself. "Manning frequently corrected the prosecution's version of events. When Fein said there had been a skylight and windows outside his cell, Manning replied: "Further down the hallway, yes sir." On Thursday Manning had testified that he could only see the natural light that came from these windows as a reflected gleam when he held his head to the door of his cell and looked through the crack. "Fein read from a weekly series of reports signed by Manning that gave a progress report to his army liaison officers. Most of the reports recorded that the inmate thought his treatment at the hands of the guards and the brig facility was 'excellent' and several said that he had 'no issues' of concern to raise. "Manning, however, said he had regularly discussed his frustration at being held so long under a so-called "prevention of injury order" or PoI – which is only marginally more relaxed than full suicide watch – but the officers had chosen not to write that on the form." As we reported, yesterday, Manning testified for the first time since he was arrested in May 2010. The AP says that today was the first time Manning had gone face-to-face with his prosecutor. "Manning testified Friday that he stood at naked attention for morning count one day in 2011 after a guard appeared to object to his use of a blanket to cover himself," the AP reports. "He said he had been put on 'suicide risk' the previous day after making a motion as if to hit himself in the head during a heated discussion with the brig commander about his confinement."